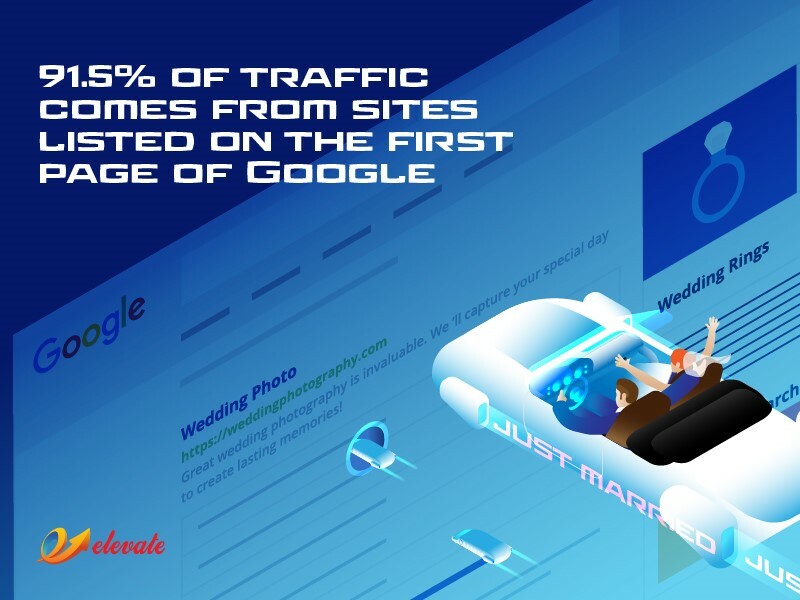 Web content and SEO have a complicatedly intricate relationship; for the field of digital marketing, SEO and web copywriting (“SEO copywriting”) represent an important marriage, a vital necessity of attachment. Without a concrete, target audience in mind, even the sharpest and most meaningful copy is ineffective. Define SEO; and discuss why SEO and Copywriting should work together, not against each other. Make the case for why your company can’t afford bad content; this is to say, poorly written and/or ineffectual (un-SEO’d) content. Okay, to start off, what’s SEO? Search engine optimization (SEO) is the process of enhancing your web content so that a search engine (e.g., Google, Yahoo, Bing) will prioritize it as a top result for searches yielded from a given keyword/search query. Incorporating keywords into web content and HTML (meta tags), etc. Why does your business need SEO? Well, it’s really quite simple: Your website may serve as your business’s online hub, an online presence you’ve developed for the express purpose of producing sales leads, but how can you expect to generate leads if prospects can’t find you? 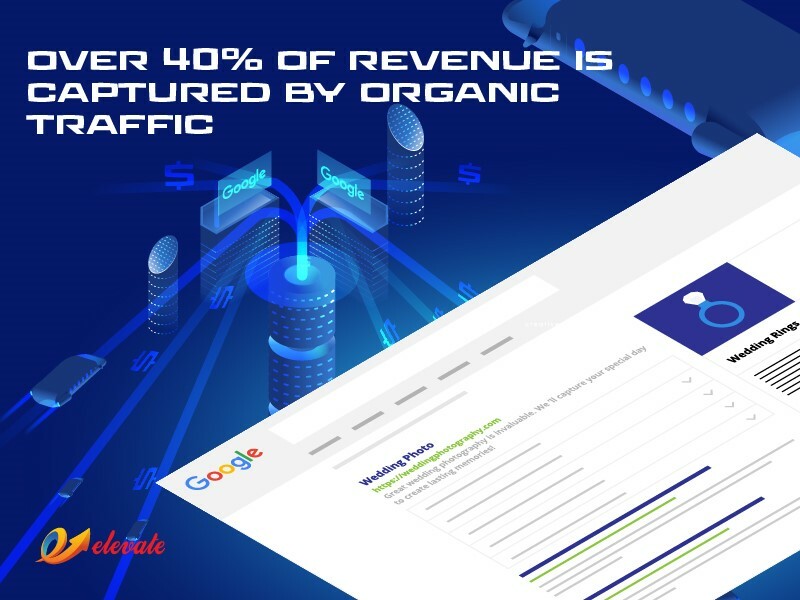 Over 40 percent of revenue is captured by organic traffic (BrightEdge). If leveraged properly, organic SEO is a goldmine. Getting your business on the first page of Google should be more than a wish, it should be part of your overall digital marketing strategy. But getting there is a whole other story. Have a website? Great. Thinking about SEO? Even better. But SEO is not as simple as 1+1=2. Successful SEO involves more than just keywords. For one, you need content. And a lot has changed since the infantile search engines of the early 2000’s, for good reason. If you aren’t old enough to remember the good ‘ole days of searching Google and seeing tons of spam websites, you used to be able to get away with jamming keywords in every conceivable place to rank for search phrases, and, regardless of whether your content was substantive, you’d have a good shot of ranking on the first page. During this time, copywriting emphasis was on the search engines while neglecting the human audience for whom search engines were invented to aid in the first place. But this has changed. It’s no longer about jamming in as many keywords as possible. Rather, it’s the overall quality of your content that impacts how well your website will rank in the search engine. This is to say, shortages in subject matter knowledge, or failure to satisfy the reader, represents poor quality content that likely won’t rank where you want it to. So to wrap up: keyword stuffing, or producing webpages whose purpose does not extend past chasing search term traffic, won’t fly anymore. The emphasis has returned to the searcher, as it should. Enter SEO Copywriting: writing for two infinitely complicated, but irrefutably important, audiences. Writing for the web (a human audience)… which requires SEO to rank in search engines so it can be seen by humans. Writing for SEO (search engine audiences) … which requires quality content so the search engines deem it relevant and rank it. Copywriters who don’t know anything about SEO and are stubborn (or unable) to learn anything about SEO. SEOs who aren’t writers, whose web content is SEO’d but poorly written, poorly researched, not substantive, or uninspired. In a perfect world, all businesses would staff writers and SEO specialists, the two working harmoniously and intimately together, and respecting the importance of each other’s respective expertise in delivering sharply-conceived, high-performing web content. Unfortunately, in many real-life situations, where budgets are limited and staffing constricted, problems arise when prioritizing one specialty over another: e.g., “I need content that’s optimized, so I’ll just hire an SEO to write my content;” or, “I’d rather pay for good content than worry about SEO.” The logic in both of these scenarios is digitally dangerous. Don’t let either happen to your business! Writing for the web is high-stakes. The writing can’t take a backseat to SEO, nor vice versa. It’s not one or the other; it’s both. And the proof is in the pudding. 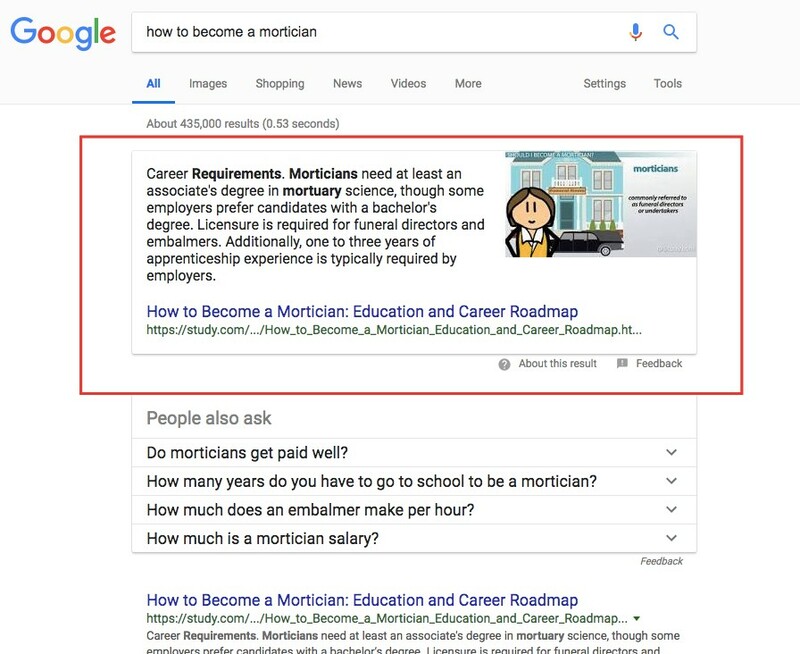 In August 2018, Google announced a new form of Featured Snippets, which, when an appropriate query is entered, pulls useful information related to the topic you’re searching. The overwhelming emphasis is based on helping the searcher find the most relevant information, as fast as possible. To the business professional, these Featured Snippets represent an extra juicy prize at the end of the proverbial tunnel, where your SEO efforts come into fruition and pay off big. But how do you launch a successful SEO campaign that achieves first page rankings and possibly lands a Featured Snippet like this? It’s all about establishing and writing toward search user intent. What’s search intent? Whereas SEO broadly is the practice of getting your website higher in the search results, user search intent is the SEO practice of optimizing your content to match the most common commercial intent(s) associated with your target keywords. Informational: Searches that are performed to answer a question or learn something (e.g., “flu symptoms,” “Chicago housing market,” “best LCD tvs 2018”). Navigational: Searches that are performed to locate a specific website (e.g., “Spotify,” “Chase bank login,” “Senate website”). Transactional: Searches performed in order to purchase something (“motorcycle insurance quote,” “kittens for sale,” “subscribe to Chicago Tribune”). 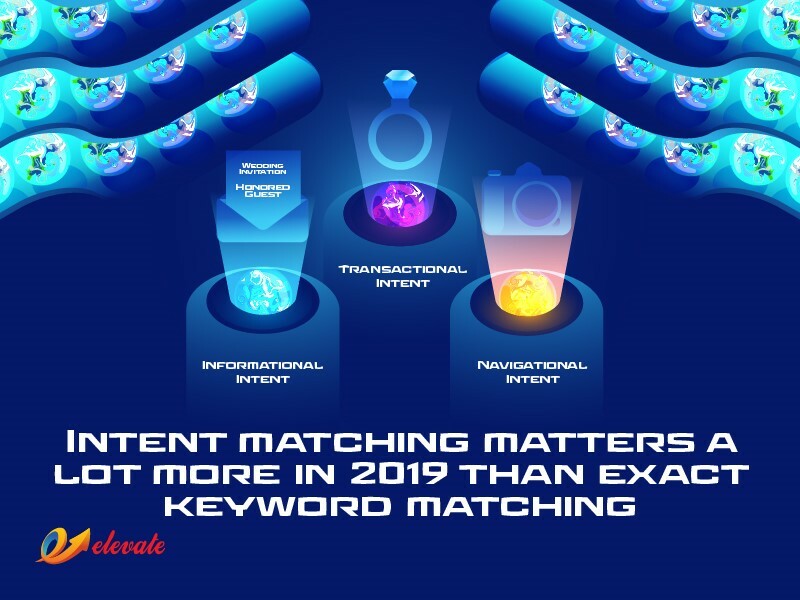 Determining the potential intent for a given search and tailoring your content toward that end is the most likely SEO strategy to be rewarded by search engines with intent matching mattering more than exact keyword matching. 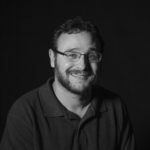 In other words, fretting over using the exact phrasing of keywords and heavily featuring them within your web content won’t necessarily help you if your competitor’s content more precisely identifies the user’s intent and matches it—authentically quenching the user’s thirst for knowledge. So to wrap up: What might a 2019 SEO strategy look like? To help optimize your content further, your SEO strategy should also incorporate engaging storytelling and enhanced visuals, graphics, and video. When your SEO and copywriting work together, the possibilities are limitless. We hope this helps you in your journey to make modern SEO’d content. Whether you’ll be tackling the writing and SEO yourself, or enlisting a full staff of people to deliver all aspects of your business’s SEO content strategy, Elevate Creative Group has the perfect mix of Copywriters, SEO experts, and SEO Copywriters. Let’s determine an ideal match for your business content needs together. Like what we’re throwing down? Contact us HERE so we can chat about how we can help with your content strategy.